Corporate bonds offer incredibly poor prospects under any scenario, according to Jeffrey Gundlach. If rates rise, prices will drop quickly because their durations are between 7 and 10 years. Falling rates are no better, he said, because they would be accompanied by a bear market in stocks with effects that would extend to corporate bonds. Gundlach, the founder and chief investment officer of Los Angeles-based DoubleLine Capital, spoke via a webcast with investors on November 13. The focus of his talk was DoubleLine’s core and flexible fixed-income mutual funds, DFLEX and DBFLX. The slides from his presentation are available here. The problem facing the corporate bond market is excessive debt and an oversupply of bonds. 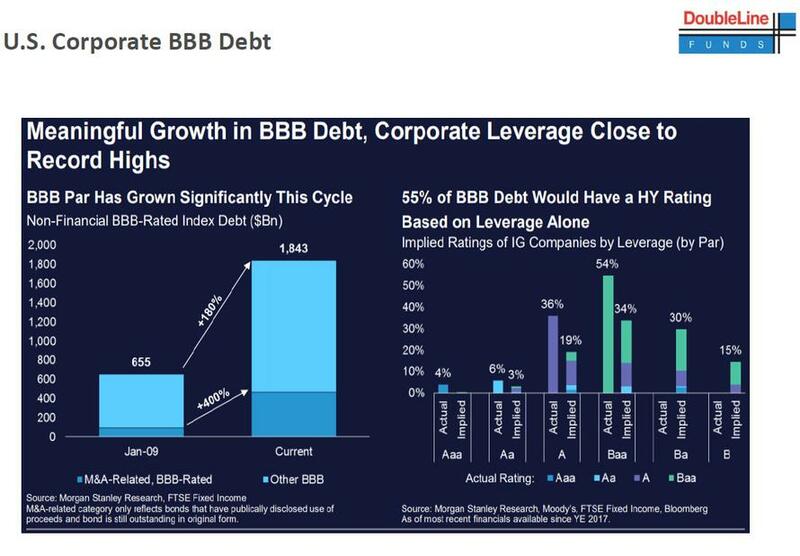 There is a lot of leverage among corporations, Gundlach said, which can be seen in “massive increases” in the size of the investment-grade market and a deterioration in the quality of debt. Spreads are tight, according to Gundlach, but are “tighter than you think, because quality has been systematically going down” in the covenants that are offered by corporate issuers. “Spreads and debt levels are out of sync with one another,” Gundlach said. That dichotomy is illustrated in the graph below. 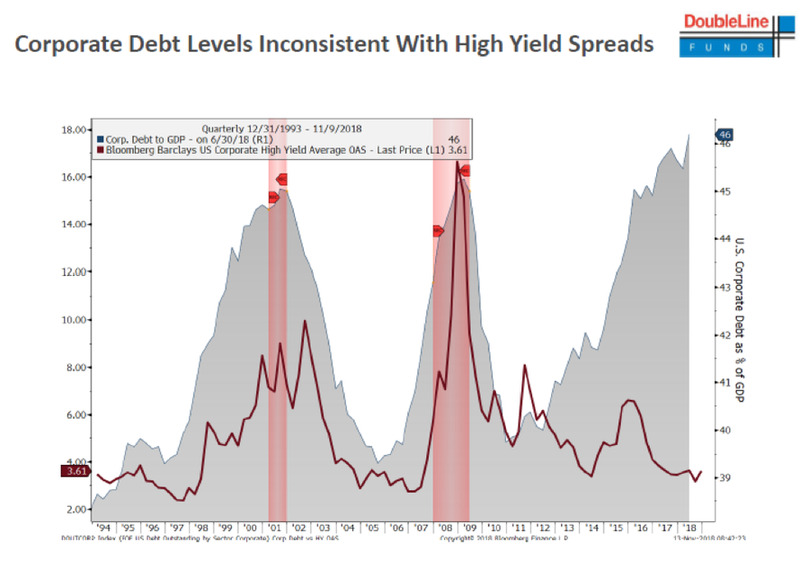 The shaded area depicts leverage (the corporate debt-to-GDP ratio) and the black line is the option-adjusted spread between high-yield (junk) and Treasury bonds. The two moved in sync from 1994 until 2013, after which leverage increased without a similar increase in spreads. As a result, both corporate and high-yield bonds are at or close to their most extreme levels of overvaluation historically, based on DoubleLine’s proprietary methodology. That methodology looks at the spreads of those bonds relative to similar-risk Treasury bonds; those spreads are approximately two standard deviations above their normal level. The BBB-rated market, which has the lowest rated corporate bonds, is two-times bigger than the high-yield market. If those bonds are downgraded to junk, Gundlach said, it will “flood” the high-yield market. If corporate bonds were rated based on their degree of leverage, then 55% would be rated junk, according to Gundlach. They have not been downgraded by the ratings agencies because corporate issuers have made “soothing statements” to assuage the agencies. Gundlach called those statements “hopeful talk” about addressing debt in the future, which has kept ratings high. But a supply shock would lower junk bond prices, he said. Gundlach said he doesn’t own a lot of corporate bonds relative to his fund’s normal weightings. He also commented on the economy, politics and prospects for economic growth. The driving force behind global economic performance is central-bank monetary policy. The global stock market has changed course, Gundlach said. Those markets rose in parallel with rising central-bank balance sheets, but are now falling across the globe, he said. The NYSE composite is down 4% on a price-basis year-to-date. It peaked on January 26. 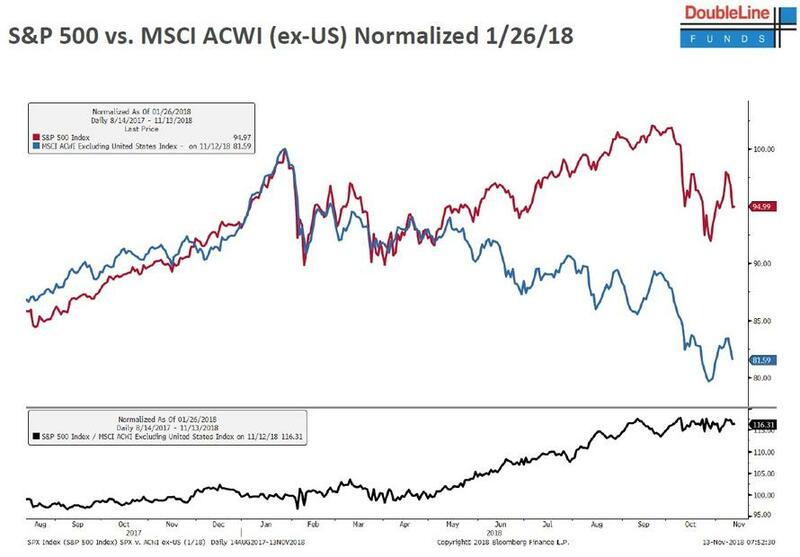 Since then the U.S. and global equity markets followed one another until early May, at which point the rest of the world fell sharply. The S&P went up until early October, when the U.S. and the rest of the world fell and moved in sync, he said. Why did the rest of the world fail to keep pace with U.S. markets until October? Gundlach said that it is because tariffs are clearly worse for other counties than the U.S., which has only 8% of its economy reliant on exports. For other counties, that percentage is much higher – he cited 43% for South Korea. 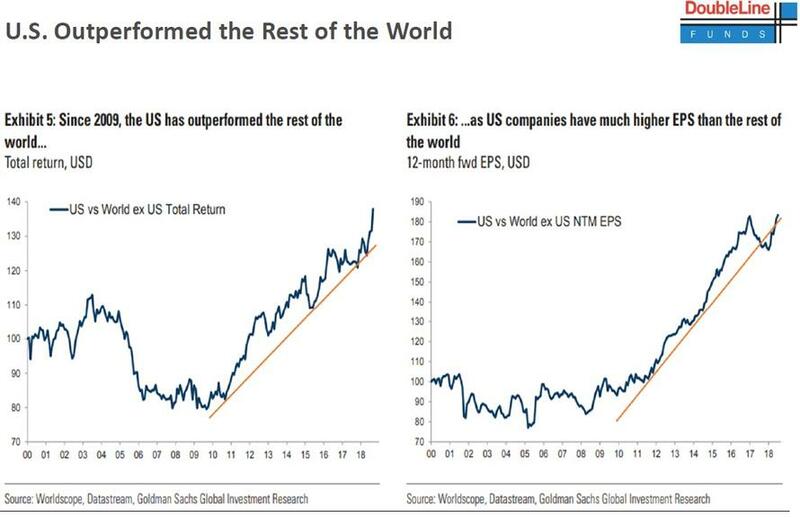 The U.S. has outperformed the rest of the world since 2009, as it has out-earned other countries on an EPS basis, he said. “But the most recent up-move was not justified on an EPS basis,” Gundlach said, in reference to the S&P gains until October. 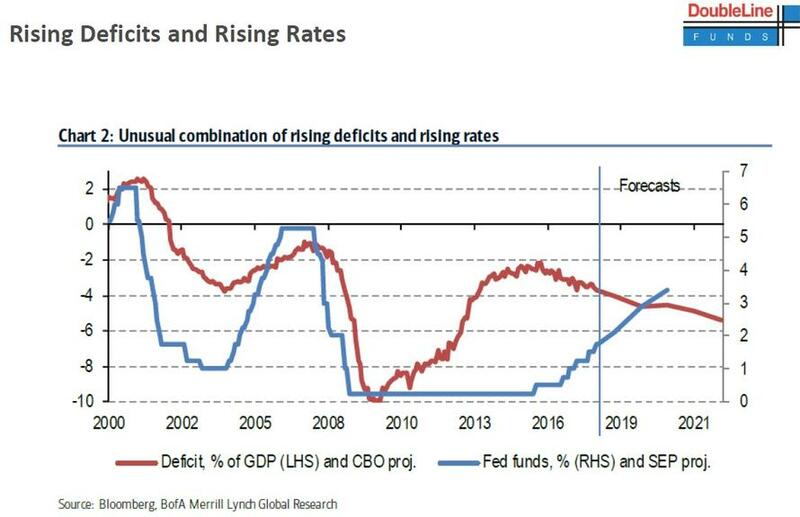 The midterm election outcome will widen the deficit further, Gundlach said. Democrats will support a 10% middle-class tax reduction, as will Republicans and Trump. “I think that will go through,” he said. The outlook for deficit reform is cloudy. Four of the 2020 Democrat presidential candidates (Cory Booker, Kamala Harris, Bernie Sanders and little-known Andrew Yang) are all campaigning by advocating a form of “free money,” Gundlach said. Their programs range from negative income taxes to straight giveaways to segments of the population. All of the recession indicators are “flat-out positive” (not signaling a recession) or are not in a flashing-yellow warning zone, Gundlach said. There has never been a recession without the leading economic indicators going below zero. “We are a long way from that,” he said. Small business optimism is just below its all-time high, CEO confidence is at a very high level and consumer confidence is its highest in 16 years, he said. 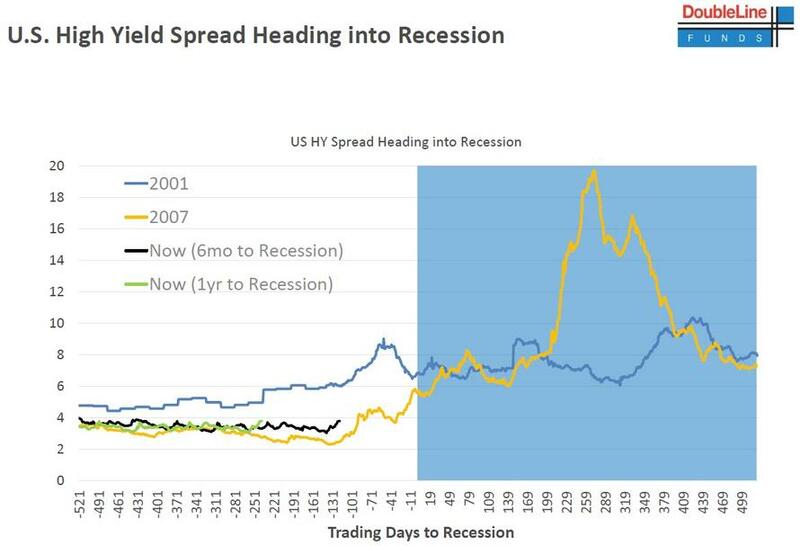 High-yield bond spreads over Treasury bonds rose approximately 400 basis points prior to the 2001 and 2007 recessions. Those spreads have recently widened by about 75 basis points, Gundlach said. “It looks a little bit like the 2007 recession, but it is not definitive,” he added. 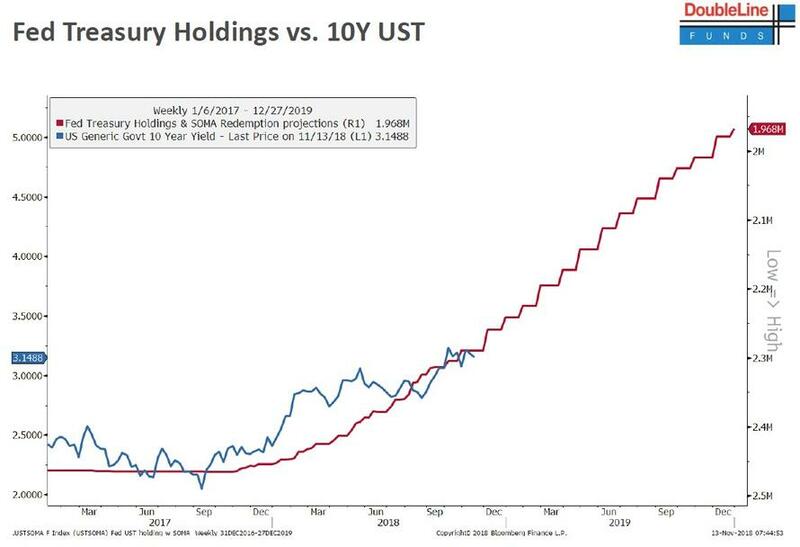 As the Fed started its QT, the 10-year Treasury yield has risen pretty much in sync with the shrinkage of the Fed’s balance sheet, Gundlach said. When the stock market fell in October, the 30-year Treasury yield went up slightly, he said. It is very unusual for this to happen when equities are in distress, according to Gundlach. As a result, he said it’s very possible yields could go up in a recession, if for no other reason than the large amount of pending bond issuance. “These are very alarming trends,” Gundlach said. There are $7 trillion of Treasury bond maturities due in the next five years with a 2% average coupon, he said. With yields at 3%, those bonds will have to be replaced with higher cost debt, resulting, he said, in another $150 billion of interest-rate expense given current market conditions. 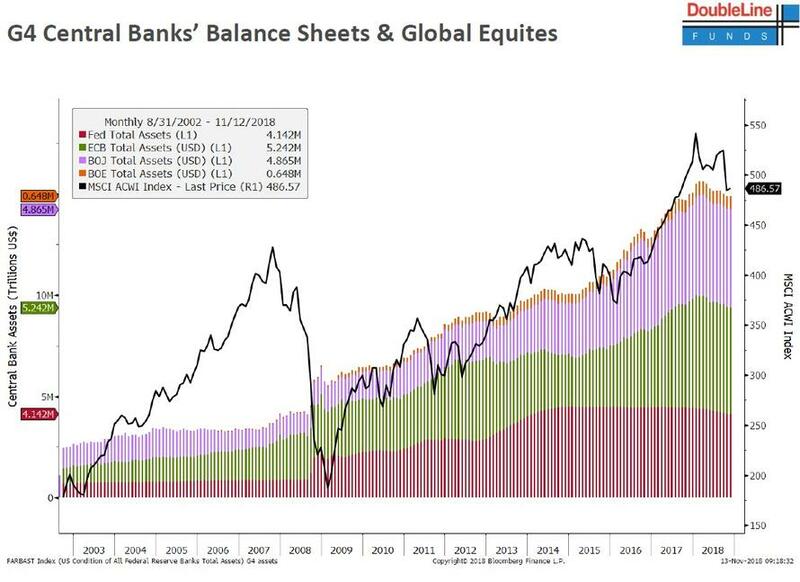 Gundlach referenced “underlying problems in the core of the European banking system,” based on the fact that the stock prices of Deutsche Bank and Credit Suisse, two large European banks, have declined precipitously. Emerging markets have been weak as the dollar has strengthened, he said. 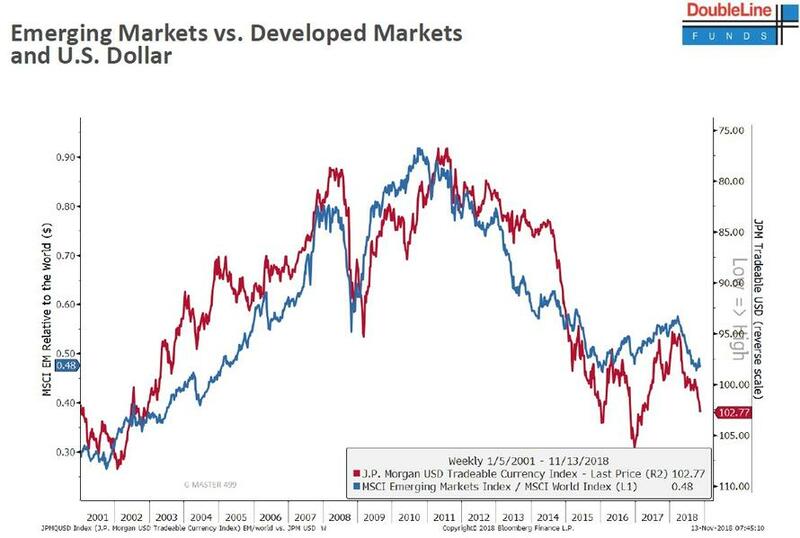 “The success and failure of emerging markets are with the fate of the dollar,” he said. “Bullishness on the dollar is extraordinary,” but he said he does not expect the dollar to rise to the level of its high in 1984. 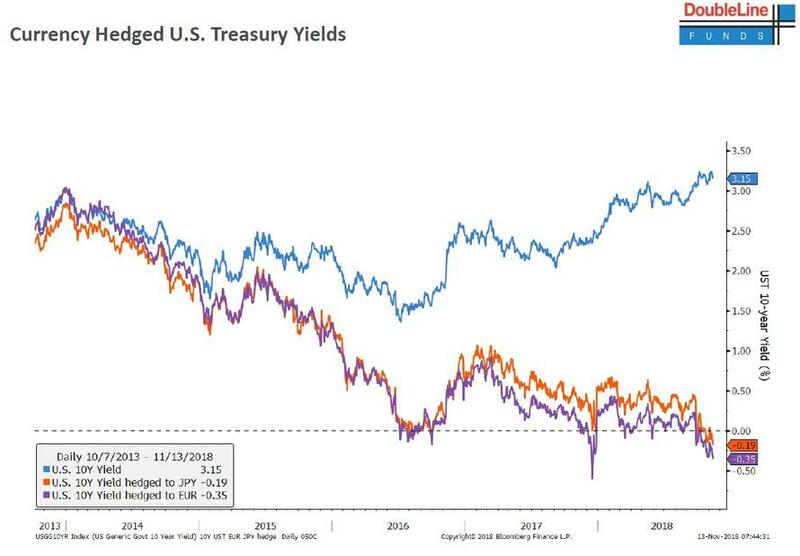 Treasury bonds are unattractive to foreign borrowers because of the U.S. trade policies and because hedging costs are too high, Gundlach said; the currency-hedged yields on foreign sovereign bonds are below zero. 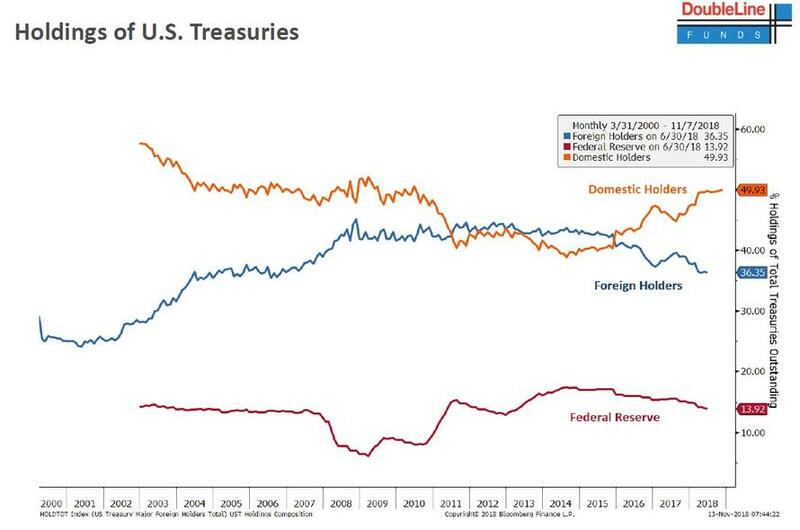 Domestic demand for Treasury bonds has been higher and has offset the lack of foreign demand. There is a positive, albeit small, real rate of return on Treasury bonds. Unless inflation goes down (which Gundlach said is likely) Treasury bonds are unattractive to domestic buyers. The 30-year yield could be 5% or 6%, he said, “but it may take a while. We are on track to hit 6% by 2021,” as per a prediction he made some time ago. Those looking for a risk-free investment should opt for two-year Treasury bonds, he said, which yield 2.90%. When they mature, he said, there will be better opportunities.